I cut it down a little to suit my purposes. So this recipe yields about 14 pieces. Garlic Powder, Salt, Pepper and Basil to taste. Combine the cheese dough ingredients. Mix them together till soft and combined completely. Refrigerate for 1-2 hours and then take a little dough and put the string cheese in the center. Encase the string cheese in a nice amount of dough to form a long medium sized rod. One that is done put those pieces into the refrigerator for another hour or so. Prepare the egg mixture. Put the string cheese encased in dough into the corn flake crumbs then the egg and then the corn flake crumbs again. Bring a pan with amount of oil to your liking to a simmer then turn it down to a small-medium flame. Drop the breaded cheese dough into the pan carefully. Fry them on both sides till they are golden brown. Serve with some ketchup or marinara sauce to dip mozzarella sticks into. 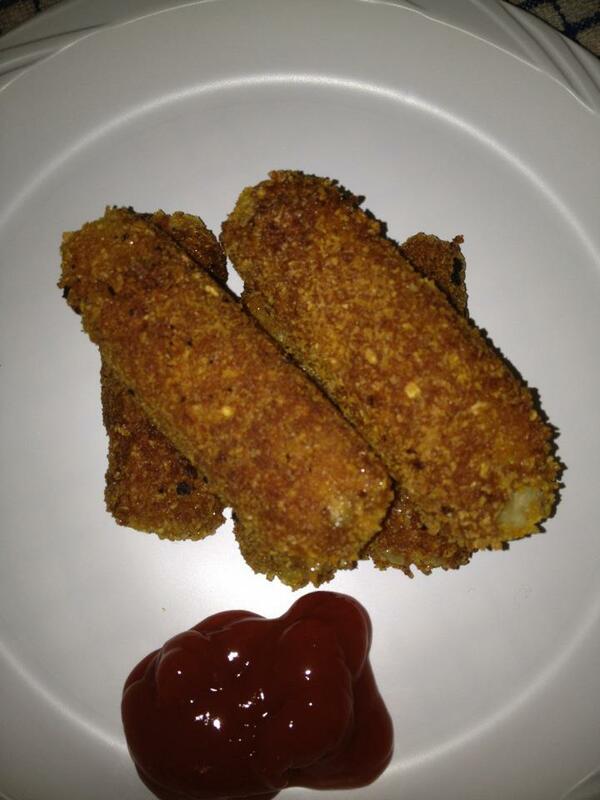 I have tried many recipes for mozzarella sticks since they are usually so amazing in most dairy restaurants. None came out they way this did- cheesy and perfectly awesome! Some tips: You can double or triple this recipe if you are serving it to alot more people. This recipe is great finger food. Can be served as a snack like I did or as an appetizer or side dish along with a meal. I'm pretty sure this would also make a great dairy party food if they were made a little smaller and wrapped in some sort of paper to avoid getting people dirty at all. What treats do you enjoy on the weekend?